Received this story from a reader this morning. I had to rub my eyes several times before I could believe what I was reading and in the Toronto Star no less. Someone that understands electrical generation writing the truth about wind generation. Wow! I and thousands of others have been saying the same thing for years. All the articles until the last few days seem to be written by one “green group” or another pushing wind and telling us about their vision. All I can say is try heating your home or running your business on a vision. The vision 60-80 billion ( money that is not going to health care, education, agriculture or many other places the money would be better used) and the air won’t be any cleaner. The truth is getting out but will this be enough to stop the madness presently found at Queens’ Park. Don’t forget both the Conservatives and the NDP have bought into and have been promoting this same “MAD” vision. I have included the emails for all MPP’s in this Province at the end of the article. Take a minute and send them your thoughts. Wind is and always was about the creation of carbon credits. Not cleaner air. But since most of this new renewable energy will be from wind, it may not be the smartest move for Ontario because its large hydro and nuclear capacity is not compatible with wind generation. Wind requires natural gas-fired generation for support and natural gas will be a most precarious fuel for Ontario. Since Ontario’s wind generators require natural-gas-fired generation for support, this creates an uncertain future for wind turbines and their transmission infrastructure that one day will not be compatible with a nuclear/hydro powered grid. Nor is there an environmental benefit to adding wind to a clean nuclear/hydro grid. The government’s power plan envisages nuclear supplying 40 per cent of electricity demand by 2027. This should be raised to more than 70 per cent, with hydro supplying most of the remainder. If there is no market for nuclear-generated electricity during off-peak and overnight hours (for power exports, recharging electric cars, producing hydrogen and/or compressed air for generating clean peaking power and other uses), the plants can reduce their output to meet the demand. This means that even if practical wind energy storage were available, wind still would not be needed on a future all nuclear/hydro grid. The demand on the grid from recharging electric cars should not be underestimated. The president and CEO of French nuclear giant Areva said that it would take an additional 6,400 megawatts of electricity if just 10 per cent of France’s cars were electrically powered. That translates into about 1,700 megawatts (two Darlington-size units) for Ontario. In France, the nuclear energy share of electricity production is about 78 per cent from its 58 reactors, with the balance divided nearly equally between hydro and fossil, and with the nuclear units able to meet daily changes in electricity demand. Sweden has a grid the same size as Ontario’s but with almost all nuclear/hydro generation. Wind has no long-term future in Ontario and will be more of a hindrance than a help to the grid’s reliability. The Ontario Energy Board should take a good hard look at the government’s Integrated Power System Plan, eliminate wind and promote cleaned-up coal-fired stations operating past 2014 until sufficient nuclear is online to avoid the building of anymore unsustainable gas-fired plants. The technical, economic and environmental issues associated with wind power have not been fully explored. Let’s hope the Ontario Energy Board will give them due consideration when it reconvenes so that money can be put where it will do Ontario the most long-term good. Donald Jones is a professional engineer, now retired after 35 years of CANDU system design. They should know – they build wind farms. Germany is in the process of building over 20 new coal plants. Wind energy is so unreliable that even if 13,000 turbines are built to meet EU renewable energy targets, they could be relied on to provide only seven percent of the country’s peak winter electricity demand, according to a leading power company E.On. E.On has argued that so little wind blows during the coldest days of winter that 92 percent of installed wind capacity would have to be backed up by traditional power stations. Ted Cowan, a researcher with the Ontario Federation of Agriculture Farm Policy Research Group. Ted Cowan cautioned farmers and landowners on lease agreements, providing an updated list of 30 recommendations from the OFA. “I’ve seen over 30 leases, and there are problems with every one,” said Cowan, who outlined key considerations necessary to protect the rights of the farmers contemplating a wind power lease agreement. “Don’t sign a lease until you have considered the choices and determined what is best for your farm operation for the next 20 years,” he said. Cowan said some wind power companies are not giving a fair share of their profits, typically around 2 per cent, noting that the OFA recommendations call for a rent of 3 per cent for the first eight years, then going up to 8 or 10 per cent. The OFA also suggests that farmers contact their power distribution company to acquire their own right to connect. Farmers were also cautioned on assessment and tax implications. “It’s your farm – it’s your taxes,” said Cowan, noting that the landowner was ultimately responsible for taxes on their property. In addition, Cowan said there was no guarantee that the provincially imposed caps on assessments and taxes would remain in the future. “I don’t know, taxes could be 50 times of what they are right now,” he said. Outside of lease and legal considerations, there was detailed mention of more serious problems encountered by farmers with nearby wind power installations at the first meeting. Cowan said a farmer had lost some cattle due to problems from stray voltage encountered right after a wind power development was commissioned, an incident that came to the attention of the OFA at the end of last year. Cowan declined to state the location of the incident, except to say it was in Ontario. “If you put your hand on his barn wall you will have 83 volts going through your body,” said Cowan, who noted that voltage has a greater effect on cattle because of their large body size, causing changes in the animals watering and feeding habits. “Yes, it could be a problem here,” said Cowan, speaking of Essex County’s numerous municipal drains and notorious wet soils, which can act as conductors of stray voltage. To make the matter worse, Cowan said the farmer had not been getting help from the power companies or his municipality. “Typically, it was who can run away from the responsibility the fastest,” he said. An estimated 1,200 bats, most of them probably just passing through Montana, were killed after striking wind turbines at the Judith Gap Wind Farm between July 2006 and May 2007, according to a post-construction bird and bat survey. Wind farms and transformers erected too close to peoples homes cause noise problems. It’s that simple. Expect to see many more law suits in the future. Both the Wind Industry and the MOE continue to ignore any noise or health study that would require wind farms to be erected at safer distances. People continue to suffer noise and health issues and the MOE and the Wind Industry continues to ignore them. When you see a turbine, understand what it is. It is not clean, green renewable energy. It is the continuation of the Enron Scam. A commercial wind farm operator in Melancthon is asking the court to dismiss a $1.25 million lawsuit brought against it. Canadian Hydro Developers says its transformer in Amaranth “has not produced excessive or disturbing noise at any time,” as claimed by a neighbour. Paul Thompson filed the lawsuit in February seeking compensation for damage and special damage from Canadian Hydro Developers and property owner Hendrika Broeze. Canadian Hydro leases land from Broeze for its transformer. Thompson claims noise from the device has caused “substantial and unreasonable interference” with his home and industrial equipment repair business since it began operating in early 2006. His claims have not been proven in court. The transformer handles electrical flow from the Melancthon I Wind Project, which includes 45 wind turbines. Canadian Hydro recently received approval from the Ontario Municipal Board to move ahead with the second phase of the project — 88 more turbines and a second transformer to be located on the same property as the first. During the OMB hearing, Canadian Hydro announced plans to swap out the existing transformer with a quieter model. The second transformer is also to be of the quieter variety. “Since the transformer began commercial operations … Canadian Hydro has undertaken, and continues to undertake, significant efforts to further reduce potential sound emissions from the transformer,” offers the statement of defence. Those efforts include noise monitoring and construction of a sound barrier around the transformer perimeter. “Since that time, all noise level measurements taken near the transformer and on neighbouring properties have been compliant with noise guidelines issued by the Ontario Ministry of the Environment,” the defence continues. In his statement of claim, Thompson acknowledges the acoustic barrier has lessened the transformer noise. However, he says it continues to interfere with his sleep and is the source of stress and tension in his life. The Amaranth man further maintains transformer noise has rendered his property, which has been in his family since the 1800s, “undesirable, or significantly less desirable,” therefore decreasing its value. The developer insists that if there are damages from the transformer, which it denies, those damages are the result of Thompson’s “abnormal sensitivity” and suggests he has failed to mitigate those damages. He wants to cover Ontario with wind farms regardless of the facts. Susan Williams Sloan, a spokeswoman for the American Wind Energy Association, said those technical challenges are not insurmountable. She said part of the solution is to locate turbines in diverse areas of the state. “When the wind is not blowing somewhere, it’s always blowing somewhere else,” she said. Sloan also said that technological advances will make it easier in the future to forecast wind energy. About 4,356 megawatts of wind turbines are currently installed in Texas, she said. EVANSVILLE — Regulations being considered for wind turbines in Union Township would make a proposed wind energy project in the township impossible, the wind developer said this morning. Wind turbines in Union Township would need to be at least one-half mile from homes and 1,000 feet from property lines, according to a proposed wind ordinance presented to the Town of Union Plan Commission on Thursday night. The town’s Wind Turbine Study Committee was charged with investigating wind turbines and writing a proposed ordinance to regulate them. Curt Bjurlin, Wisconsin project developer for EcoEnergy, said he is disappointed with the draft ordinance because he said it is “far more restrictive” than the state’s model draft ordinance. “I think the town leadership realizes the people in the town and surrounding area greatly desire the need to have renewable energy,” he said. Bjurlin said EcoEnergy staff will work with town officials and residents to answer questions. “We’re dedicated to building this project and moving forward,” he said. The recommended setbacks are the absolute minimum, committee chairman Tom Alisankus stressed, because the committee’s research suggested distances of up to 12 miles. The town board appointed the seven-member committee in September, and it has met nearly every Saturday since. The town board imposed a stay on construction of large wind energy systems until August. EcoEnergy is proposing to put three 397-foot tall wind turbines in the township. Wisconsin Public Power would buy the energy to be used by Evansville Water and Light customers. A town attorney will review the committee’s recommendations, and the plan commission will discuss the ordinance at its Thursday, Feb. 28, meeting and likely hold a public hearing at its March 27 meeting. Committee members worked hundreds of hours, and committee member Jim Bembinster visited wind farms as far away as Wasco, Ore., Alisankus said. The committee’s results are summarized in a 318-page report, along with a 25-page draft ordinance. Members looked through thousands of pages of documents and only considered information that was peer-reviewed or cited by reputable sources, Alisankus said. Doing so eliminated any influence from members’ personal feelings, he said. Committee members started with the state’s model draft ordinance, which Alisankus said left a sour taste in their mouths. They sent an open records request seeking the scientific and medical documentation used to develop the state’s model ordinance, which has an “aura” of state approval, he said. “The committee was shocked to receive a response to this open records request that in fact there was no scientific or medical documentation used to create the model draft ordinance,” he said. Instead, the state sent them 11 pages, most of which were notes from meetings used to write the ordinance. It appeared the ordinance was written predominantly by a Florida power company, Alisankus said. The committee also invited stakeholders to participate and sent lists of questions to the companies involved. Setbacks and sound were key to the committee’s work, he said. “If you control … the setbacks and the sound levels appropriately, there should be no issue with ultimate construction of these turbines, at least with respect to the health and safety boundaries that we had to live by,” he said. The state’s model ordinance makes the “assumption” that a 1,000-foot setback is OK, Alisankus said. EcoEnergy plans its projects to have at least a 1,150-foot setback, Bjurlin said. But the majority of the scientific and medical documentation the committee found recommended a minimum of one-half mile from homes, Alisankus said. Their research came from the World Health Organization, audiologists, physicists, acoustical engineers, doctors and residents, he said. Members of the Town of Union Wind Study Committee are Tom Alisankus, chairman; Renee Exum, secretary; Scott McElroy, Jim and Cathy Bembinster, Mike Leeder and Sue Pestor. — Wind turbines must be sited at least one-half mile from the nearest home, business, school, daycare facility, church, hospital and other inhabited structures. — Turbines must be sited at least 1,000 feet from the nearest property line and at least five times the rotor diameter from the property lines of all adjoining property owners who have not granted an easement for a lesser setback. — Turbines must be sited at least 1,000 feet or three times its total height from any road, railroad, power line right-of-way and above-ground public electric power line or telephone line. — Applications for a wind energy system must include—in part—a pre-construction noise survey within a 1-mile radius of each proposed turbine location, a sound study, an environmental study, ice and blade throw calculations plans, a shadow flicker and blade glint map, a stray voltage and ambient voltage test/plan and a fire prevention, emergency response and rescue plan. — Limits would be placed on the sound produced by turbines as measured from the outside of the nearest residence and other inhabited structures. Wind turbine ordinances can only regulate turbines in regard to public health and safety, said Tom Alisankus, chairman of the Town of Union Wind Study Committee. Ontario and most jurisdictions in North America seem unwilling to learn from the mistakes of others. It is very easy to build clean cost effective electrical systems but our governments keep on chasing the wind dream. The dream will turn out to be a nightmare for the system operators, the farmers who lease their land, the people living near the wind turbines and last but not least the ratepayers who will get hammered with ever rising hydro bills. The fields will end up as junk yards of rusting broken down turbines . The investors will come out on the good end because the wind industry is a tax scheme not an electrical system. The report below should help you understand the reality of the wind industry. 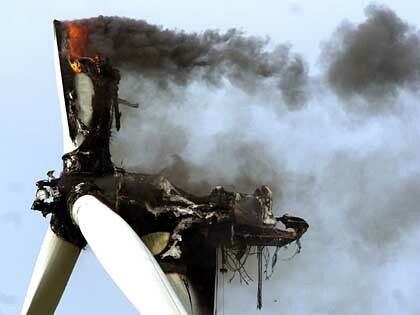 The wind turbine, which is 100 meters (328 feet) tall, broke apart in early November 2006 in the region of Oldenburg in northern Germany — and the consequences of the event are only now becoming apparent. Startled by the accident, the local building authority ordered the examination of six other wind turbines of the same model. You are currently browsing the archives for the Canadian wind power category.